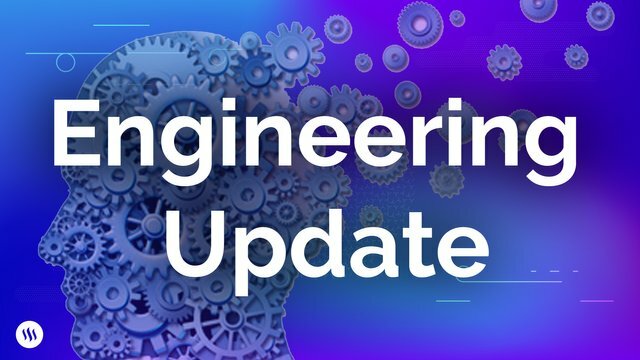 Hello Steemians, in an effort to keep you informed, we are continuing to provide updates about the different projects we’re working on. Because our engineering teams generally follow a 2-week-sprint cadence, our work this week was largely a continuation of the work outlined in our last post. We continued to optimize instance sizes for all applications and laid the groundwork for tackling reserved instances. We analyzed our data transfer costs and began identifying areas that could benefit the most from improvement and optimization. This week we are continuing to focus on performance optimizations for our MIRA implementation. As part of this process, we have begun reindexing the blockchain with MIRA running on the same type of equipment that we currently use in production for steemd nodes. This will help us get a more accurate benchmark of current performance and identify any issues that could arise during a full reindex. Since last week, we’ve completed our first pass at streamlining the social side of condenser and removing any reliance on active keys. Likewise, on the wallet side, we have simplified the initial login process and continued to remove code that is not needed in the wallet. Next we will be testing and tuning the new application flows, with the goal of ensuring the interactions between the faucet, social, and wallet applications create a seamless user experience. For more background information, check out our post on this project. In order to make the ads we show more relevant to users, we have migrated the majority of our out-of-feed ads from AdSense to Google Ad Manager. We are now in the process of moving the in-feed ads over to this new platform. We have also signed an advertisement agreement with a major crypto project. We believe that steemit.com should be a welcome home for all projects that share our goals of accelerating the adoption of decentralized and public blockchain technology and are excited to help other projects leverage our platform to increase awareness about their efforts. This is fantastic news. I don't think most Steemians will find such ads annoying in the slightest. And ads are a necessary part of a profitable front end going forward. Coingecko created a Steem account of its own (@coingecko) for marketing purposes a few months ago. Coingecko bought 3 BTC worth of STEEM and powered all of it up. They did not do this to make money. They wanted to spend money to make themselves better known among Steemians, an audience very interested in developments in the crypto space in general. This sort of thing is exactly what Steem needs! What we should do is market ourselves as a platform frequented by tens of thousands people, most of whom are keen on hearing about new products and developments in the crypto space. It would be very desirable to have many crypto businesses of all sizes come and buy STEEM and power up. That's how you will begin to achieve a high and stable value for STEEM. From what I can tell, Coingecko has conducted itself in an exemplary manner and is a great model for other corporate accounts to follow. Just asking, why don't you planning to add "Login Ads" to STEEMIT platform? I think it might be more popular and very effective advertising method as well! Moreover I could see two white spaces at the both sides STEEMIT UI while I am reading a blog post! Hope you might think about use these spaces with relevant advertising type as well! I am not sure about the ad decision. The decision to add advertisements collects user data. Is it hypocrisy to rely on google ads for a decentralized blockchain? I would argue for not having ads. However, crypto projects can have ads on Steemit, but not google ads. @dm312, steemit.com is not a blockchain but a web application owned by Steemit Inc., it serves as a front-end to the blockchain, and there are other front-ends (i.e busy.org, esteem). Since the blockchain is currently "public domain" defacto (not regulated yet) virtually anybody able to build a front-end for the blockchain is free to profit from it in any way. This is similar to OpenSource, the source code is free, you can use it to profit the way you wish. Haha, They already did mate. Steemit is using google custom search, didn't you notice that? Any plans to do something like the BAT token and distribute a portion of ad revenue to staked Steem Power holders or to the worker proposal pool? I kind of thing that this says a lot and at the same time not much really. Hopefully the progress in cost reduction and the extra income from ads will pump some pretty crazy ideas that will show more progress on the SMT's. Anyways keep the updates coming, they are healthy! Maybe they signed an advertising agreement with Tron? Ohhh... This seems to be a reference to Tron??? "advertisement agreement with a major crypto project"
Great work, any progress on SMT? Ahhhh.....let the hype and speculation begin. This is very good for Steemit. I think it will benefit the other crypto project more, and I think that project is Tron. You guys are so going to have issues with users data!! Just saying, you might have to banned European users. Remove the top bar advertisement, it looks terrible. Finally. Ads! I've been saying it since the start. This is going to change everything. whos going to Vet these crypto projects to make sure scams are not advertised? It looks like Steemit Inc. might have signed an advertising agreement with Tron @gadrian. Yup, read it Chris, so far no mention of Tron, but that's a way to explain the partnership thing. Yeah @gadrian it's just speculation but I think an agreement like that would make more sense than some of the other ideas I had.